If you have extremely oily skin, there are a lot of options to choose from. What stood out for us with Dickinson’s Original Witch Hazel Oil Controlling Towelettes was that it strong without being harsh. It removes all of the oil from your skin just as well as the products with harsh chemicals, but you don’t have to worry about irritation. Of course, these towelettes contain witch hazel which is an age-old natural skincare ingredient. But it also includes aloe. When you use these towelettes your skin will feel extremely clean, and it helps fight oil for the rest of the day. If you have combination skin, only use this product on the t-zone, it will be too drying for the rest of your face. Although it’s the most gentle product of its kind that we tried, it was drying on normal skin. Also although they can remove makeup, we don’t suggest using these on the eye area. Our tester with oily skin however was pleased with the results. And since the towelettes are individually wrapped, they’re easy keep on hand to avoid looking shiny as the day goes on. To see more of our towelette product reviews, click here. When you have oily skin, the oil tends to break down your makeup, and then over time it looks progressively more ridiculous. 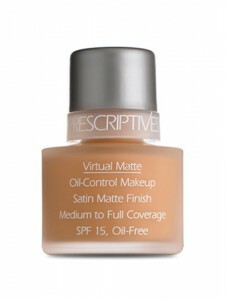 We tried Prescriptives Virtual Matte Oil-Control Makeup since Prescriptives has a reputation for being the go to brand for foundation. Unfortunately, Prescriptives is now only available online. So you might be thinking, well how would I get the right foundation? They have a shade finder online so you can select the right shade. However, we found this system to be flawed, particularly since the result is 3 shade recommendations. Your better bet is to do an online chat with one of the beauty experts who will only ask you a couple of questions. But our strategy was to not only give them a couple of celebrities that shared our skin color, but also go on our social media website and give them the image link to our pictures. By doing this we got the perfect shade in the mail! This makeup promises to not only reduce shine but also stop oil production over time. It actually does work! This is a thicker foundation that gives you medium to full coverage, so you natural gals probably won’t like it. The finish isn’t overly matte though, so at least you have a more natural look if not feel. The only drawback with this foundation is that it has salicylic acid, which can be irritating to those with sensitive skin when used on a daily basis. Virtual Matte Oil-Control Makeup costs $35 and shipping is free, but you also get free samples! We got a phenomenal two shade eyeliner and a generously trial sized day moisturizer, so the department store pricing didn’t have as much of a sting. This didn’t have the staying power as one of our favorite foundations, Estee Lauder Double Wear, but at the same time it wasn’t as drying. In sum, this is a great foundation but you need to do some extra work to make sure you select the correct shade. To see more of our product reviews on foundation, click here.